People have all four of the gifts of communication: inner seeing, feeling, hearing and knowing. Each person has a first or predominate gift. 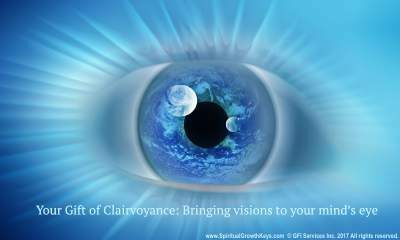 Of the four inner communication gifts, your clairvoyance or Gift of Vision is the perception that can provide a clear picture of your life. A clairvoyant person thinks in pictures or images. When you use your visionary gift, you have a running movie in your mind’s eye. If you work with vision predominantly, you’ll find that you can recall faces, dates and information more readily. Many visionaries have photographic minds. Artistry, photography and beauty can be especially important to the person who is predominate in the gift of vision. They often prefer an attractive working environment and have a great appreciation for harmony. Individuals who are high in the Gift of Vision are excellent organizers: they see the overall picture in their mind and will structure accordingly. They can have tunnel vision with their pictures or visions until they achieve completion of them. This is why they tend to be good at meeting their goals. Also, people high in vision are often very perceptive, noticing nuances and characteristics about others and situations that the rest of us might miss. However, they can also be perfectionists and sometimes excessively picky. Knowing the strengths and weaknesses of each of these gifts will help you immensely. You can use the positive side of each spiritual gift and not allow the limiting side to throw you off. A favorite vision of mine happened many years ago when, during a typical work week, I kept receiving flashes of a white cat in my mind’s eye. I thought it was pretty weird, but okay, I thought. This went on throughout the week. On Friday, in an office lunchroom was a sign that read “Cat Needs Home”. It was a white cat. I called and offered to take the cat. Until then, I had never fathomed the idea of having a cat and didn’t think they even belonged in small apartments, like mine. “Bing-Bing” and I shared many wonderful times and she changed my life and my ideas about cats, mainly that I didn’t realize now much love could come from a non-human being. Fast forward many years later, and I often foster cats and sometimes dogs from local shelters. Fostering has been an enriching, fun experience, and I can trace its start back to inexplicable visions of a white cat. Our Inner Guidance works like that sometimes. Do you see auras, the energy around a person? That is often a sign of a highly visionary individual. You can take time to relax and visualize in your mind, especially if you are high in this gift. Visualize your personal environment and how you would like to re-arrange it for better symmetry, balance and serenity. See your inner beauty shining through to the world. Seek the experiences that enhance your Gift of Vision, whether that be walking in beautiful natural settings, taking in some art classes or simply enjoying attractive surroundings. It helps to know the order of your four gifts of communication and especially your first gift. You can learn this from a certified Wayshower’s College Consultant. You can also learn to use your first communication ability more in your life and also learn to develop your other gifts. When you take time to unfold these four spiritual gifts you will connect more with different types of people and have a deeper sense of your life. This SpiritualGrowthKeys.com website along with the people and programs associated with it, sponsor webinars, Face book live sessions and workshops that help people unfold these gifts of inner communication. As people open their gifts, they are more in tune with themselves and with their angels or guides. Click here for one of these upcoming live or recorded events. Visualize yourself as beautiful, abundant and loving—and see how you can improve that image within your mind’s eye, without any need for how it may appear to others. Self-image for the sake of outside approval doesn’t work. Seeing yourself as a beautiful, loving, caring being, allows you to tune into the Real You and your angels. You will see how the pieces of your life fit together and what your part is. You’ll be feeling and living more of the life you came here to planet earth to experience.